The iBoost 800 was designed to solve an increasingly annoying issue, how to get a quality line level audio output from a portable or computer device that is as high as the audio output typically found with a good CD player. Most MP3 players (including iPodsTM) output a signal through the headphone jack that is suitable for headphones, but not quite for your stereo receiver, home theater system, DJ mixer etc. When plugging these devices into a home audio system, the flaw is easily noticed. The iBosst 800 brings the audio output level of these small devices up to a level suitable for your particular audio equipment. 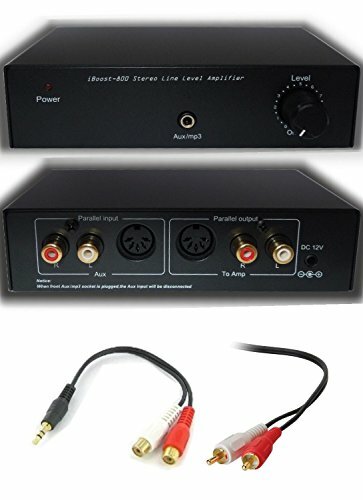 Increases the line level output by up to 20dB for any audio component with an inherently low level output, such as that found with the headphone output jack of an MP3 player, iPodTM, iPadTM, iPhoneTM, computer sound card, etc. Is also a great solution for boosting audio levels on turntables equipped with low level output cartridges when used in series with a phono preamplifier. Other applications the iBoost 800 is suitable for is the addition of a volume control between a line level source and a power amp which has no output volume adjustment of its own. Also for providing the gain needed to drive a long cable when connecting a TV's audio output to a stereo located a long distance away. Simply connect the line level output on your source device to either the 3.5mm stereo input jack on front panel or the RCA inputs on the rear. DIN IN/OUTPUTS jacks are also provided in the rear panel. Connect the output of the iBoost 800 to your amplifier, receiver, or whole-house audio controller, etc. Increase volume up to 20dB by adjusting the rotary volume control on front panel clockwise. When utilizing the front 3.5mm stereo input jack, the rear RCA inputs will be bypassed. Package Contents: iBoost 800 Line Level Amplifier, 12VDC US Power Adapter, 3.5mm Stereo to RCA adapter, 3ft Stereo RCA patch cable. If you have any questions about this product by iBoost 800, contact us by completing and submitting the form below. If you are looking for a specif part number, please include it with your message.